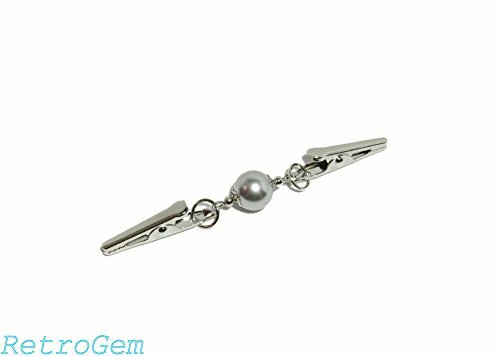 This beautiful sweater clip made with 12mm light gray Swarovski Element Pearl. The silver tone clip measures 35mm. Comes with gift-box. Made with Swarovski Elements Pearls . Silver tone clip measures 35mm. It will be ship in a gift-box. Ready to gift giving. Handcrafted in the USA. Please note: Our products are designed and manufactured in our own workshop. We only used Swarovski Pearl as an ingredient in our products. This sweater clip belongs to RetroGem, not Swarovski.